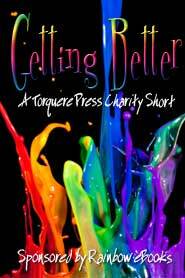 The Writing of J.Rocci: Courting #5: Competition released as Charity Sip! Courting #5: Competition released as Charity Sip! Courting #5: Competition is now available as part of the Torquere Press 2011 Charity Sip Blitz benefitting the It Get Better Project! Officer Joshua Dabbs and his husband, lawyer Garrison Williams, met while serving in the U.S. Marine Corps ten years ago. Their lives are very different now than from when they first started dating: they're out of the Corps and the closet, they're married and own a house, and they're getting ready to adopt two kids through the state. Josh figures their life is pretty much perfect. When their friends challenge them to run in the annual Marine Corps Marathon, they find themselves back in D.C. and visiting their old stomping grounds around Quantico. Garrison and Josh enter a friendly competition to see who finishes the marathon first. You can also buy all 33 Charity Sips in pdf format for 15% off the full price!